Thermography is a diagnostic tool that uses heat energy (detecting surface temperature). Currently, thermography has been applied in various ways fields which include health, engineering, manufacturing, environment, and military field. Thermography in the field of health is used for early monitoring of breast cancer. In the field of environment, thermography has been known to detect environmental air quality levels. 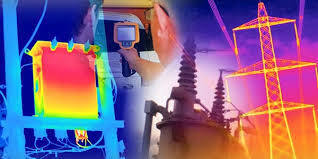 In manufacturing, infrared electrical inspection using Thermography is used to detect overheating of components, motors, generators, cables or anything else. Let us find out the benefits of thermography and how thermography is used in the process of manufacturing. Of course, the invention of thermography has a big impact on the world of industry. Most companies will try to find out how to reduce the operating cost, but they have to ensure that their products have the best quality so their customer will feel satisfied. Well, the quality of a product actually depends on how it is manufactured or how it is processed. Therefore, companies prefer to conduct planned preventive maintenance that can predict if the products or the components get an imminent failure. So, the manufacturer can conduct immediate appropriate maintenance before the products are produced. Moreover, the manufacturer can also monitor the equipment during the process. In this case, companies only need thermography that is able to reduce equipment downtime, increase product quality, improve efficiency, and increase the company profits. Well, you eventually know that Thermography really has so many advantages in many fields, especially for manufacturing. In this modern era, many industries prefer to choose thermography because it really can help manufacturer predict the failure of a product or component and conduct preventive maintenance before it is produced for sale. This allows manufacturers to reduce operational cost and it is also more efficient. The use of thermography can be used to analyze the critical equipment condition so that the manufacturer can conduct improvement or repairs before they manufacture the real product. In this case, the manufacturer can increase the quality and capacity of the product so it is good for sale. In the manufacturing process, temperature control becomes a crucial factor that must be done. With the use of thermography, manufacturers can apply this process control using thermography for various products such as paper, steel, plastic, injection molding, food,rubber, and much more. In addition, thermography can also be used to monitor and check the standard equipment like pumps, fans, motors, and others. Many manufacturers have been using sensing technologies to increase their productivity by integrating infrared thermography system on their existing machines. This on-line condition monitoring can collect data from some sensor sources and then it will predict the condition as well as plan what actions should be taken. In this case, the manufacturing process will be more efficient and cost-effective. In conclusion, thermography is really a great tool that can be used in many fields, especially for the industry. Today, manufacturers do not need to conduct manual checking because infrared thermography sensor will give immediate information related to the components.